This from a recent story in the New York Times about education in Detroit and the impact of an education environment that places a premium on choice. So, what happens when you have virtually unlimited choices? Michigan leapt at the promise of charter schools 23 years ago, betting big that choice and competition would improve public schools. It got competition, and chaos. The 1993 state law permitting charter schools was not brought on by academic or financial crisis in Detroit — those would come later — but by a free-market-inclined governor, John Engler. An early warrior against public employee unions, he embraced the idea of creating schools that were publicly financed but independently run to force public schools to innovate. So, how’s that free market working out? By 2015, a federal review of a grant application for Michigan charter schools found an “unreasonably high” number of charters among the worst-performing 5 percent of public schools statewide. The number of charters on the list had doubled from 2010 to 2014. The competition to get students to school on count day — the days in October and February when the head count determines how much money the state sends each school — can resemble a political campaign. Schools buy radio ads and billboards, sponsor count day pizza parties and carnivals. They plant rows of lawn signs along city streets to recruit students, only to have other schools pull those up and stake their own. In the waning days of the legislative session, House Republicans offered a deal: $617 million to pay off the debt of the Detroit Public Schools, but no commission. Lawmakers were forced to take it to prevent the city school system from going bankrupt. Translation: Still no real oversight, still a wide-open, chaotic market for schools. Often we hear legislators and choice advocates say that the situation in certain urban districts is so bad we may as well try to expand choices and even add vouchers or expand charter options because it can’t get worse. Detroit now has a bigger share of students in charters than any American city except New Orleans, which turned almost all its schools into charters after Hurricane Katrina. But half the charters perform only as well, or worse than, Detroit’s traditional public schools. Grace Tatter at Chalkbeat has an interesting look into emails between the Tennessee Department of Education, Measurement Inc., and school districts as the state prepared for the TNReady tests. The central message is that there were clear warning signs that TNReady simply wasn’t. The whole piece is worth a read — lots of good info about what was known and when. But, read what Cliff Lloyd wrote again. The disaster that was TNReady in 2016 could have been prevented. Both the state’s vendor and state officials simply didn’t do what was required to make that happen. The National Charter Schools Conference is in Nashville this week and includes a number of sessions, including one highlighting the work of the Tennessee Achievement School District. The Louisiana Recovery School District and the Tennessee Achievement School District have brought new attention to the role that charter schools can play in replacing poor performing schools. They have also tested the theory that the freedoms associated with chartering can in fact benefit those who are the most at risk. This panel will explore the role that charters have played in serving the hardest to educate and what policymakers should consider to better serve these students. This session happened today and included a presentation from TN ASD Superintendent Malika Anderson. It’s interesting that the TN ASD is pitched as a success story, given that the results have been mixed at best. In fact, the community at Neely’s Bend in Nashville was not too happy about being thrown into a sort of Thunderdome for school survival back in 2014. But it seems unlikely that Anderson mentioned that. The ASD community relations effort in Memphis has been so bad that the local NAACP chapter has called for a moratorium on expansion there. There’s also been some pretty thorough analysis of what appeared to be a rigged Neighborhood Advisory Committee process. Neely’s Bend is showing a growth rate well above the district average and has posted consecutive years of growth in both Math and Science, with some pretty solid numbers in Science over the past two years. Instead, the ASD has followed a rather bumpy path, growing while struggling to meet performance goals. The ASD needs growth of 8-10 points a year in the schools it operates in order to hit its targets — and it is well below that number now. That may be in part due to the rapid growth beyond original expectations. The point is this: The Tennessee ASD is hardly a success story. It’s a great story of PR spin and fun cocktail parties, but the actual results are limited, at best. And, it’s operated with quite a bit of controversy in both Memphis and Nashville. It’s never a good plan to pit one school against another in a fight for education survival. And it is certainly not clear that the ASD plan is better than the turnaround that was already occurring at Nashville’s Neely’s Bend. Those looking to Tennessee for guidance on how to create an “Achievement School District” would be best served using our state’s experience as a guide for what not to do. The U.S. Chamber of Commerce and the Tennessee Chamber of Commerce and Industry will jointly announce the launch of a college planning tool at an event in Nashville tomorrow – Tuesday, June 28th. As high school seniors and adults returning to school look for the right college and businesses seek to build the best workforce, the U.S. Chamber of Commerce Foundation and the Tennessee Chamber of Commerce & Industry will introduce a data-driven tool to help with both at a June 28 event in Nashville. The Chamber Foundation, in collaboration with Gallup and the American Institutes for Research, has developed a state-level college planner that will give prospective students a scientific way to evaluate colleges and the kinds of future employment to expect following graduation. The Tennessee version is among the first such programs in the country. “Tennessee students and Tennessee businesses have a common interest in our colleges and the kind of education they deliver,” said Bradley Jackson, interim President of the state Chamber. “College is one of the biggest investments Tennesseans make, and they want some idea of what kind of job they can expect to find after graduation. The kickoff program will feature remarks by Commissioner Burns Phillips, head of the Tennessee Department of Labor and Workforce Development. An informal panel discussion will follow and will include David Mansouri, President of SCORE (State Collaborative on Reforming Education); Mike Krause, Executive Director of Governor Haslam’s Drive to 55 and Tennessee Promise initiatives; Ashford Hughes, Senior Advisor on Labor and Workforce Initiatives in the office of Mayor Megan Barry, and Russ Deaton, interim Executive Director of the Tennessee Higher Education Commission. The event will begin at 10 a.m. at the AT&T Conference Center, 333 Commerce St., in Nashville. The kickoff is aimed at introducing the college planning tool and creating a conversation about college programs that best serve the widest array of students and employers. Learn more about USA Funds’ College Value initiative at www.collegevalue.net. After controversy and boycotts, the Nashville Rise forum was held Thursday night with an estimated crowd of over 400. There were parents, families, teachers, administrators, and elected officials in the crowd. The crowd included many non-native speakers who were receiving live translation directly to the headphones they were wearing. In all, four candidates did not attend. Will Pinkston, Amy Frogge, and Jill Speering boycotted the forum. Janette Carter, who is running against Sharon Gentry, was ill and was not able to make it. Those who attended included: Sharon Gentry, Jane Grimes Meneely, Christiane Buggs, Miranda Christy, Corey Gathings, Erica Lanier, Jackson Miller, and Thom Druffel. 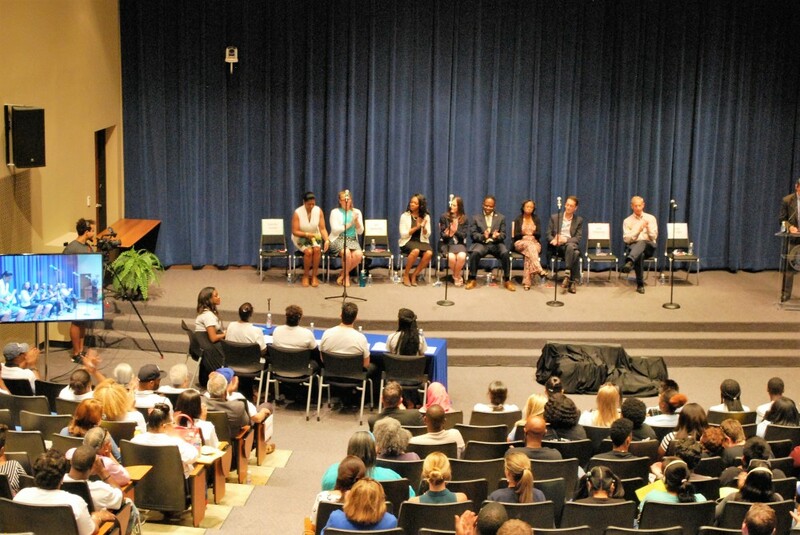 The questions for the candidates mainly came from parent members of Nashville Rise. While there are around 100 parent leaders in Nashville Rise, a few were selected to ask questions of the candidates. The questions asked during the forum were about traditional and charter schools collaborating, how we can best serve schools with a high ELL population, student based budgeting, retaining teachers, and closing the achievement gap. The questions allowed all the candidates to give their vision for the school board, something that would have been nice to hear from the three candidates that boycotted. Will Pinkston, Amy Frogge, and Jill Speering refused to speak to 400 community members who care about the future of Nashville’s education. The stage would have been theirs to describe why they disagree with the other candidates and state where they see the future of Nashville’s education going under their watch. Last night, many spoke to the future of respectful collaboration with Dr. Joseph and all members of the school board. This was an incredible opportunity for all candidates to participate in a positive, collaborative exchange. Instead, there were empty chairs with their names on it. Wendy Tucker of Project Renaissance, which oversees Nashville Rise, is in the Tennessean disputing the lies made from a handful of school board members. Wendy Tucker does a great job at laying down the facts around Nashville Rise and Project Renaissance. Like I have previously written about, Tucker first discusses that one of Will Pinkston’s demands was a list of schools that the parents of Nashville Rise send their kids. We sincerely hope Mr. Pinkston is interested in the needs of all children in his district and across Nashville, not just of those who attend schools he condones. She then delves into the fighting back the lies that have been spread. Hasn’t Project Renaissance/Nashville Rise hidden their funding from everyone? Not true. When reporters asked for our Schedule of Contributors, we provided it immediately. When The Tennessean asked for our tax return, we provided that immediately as well. Isn’t Project Renaissance funded by the Eli Broad Foundation? Not true. Mr. Pinkston and school board member Amy Frogge have attacked the Eli Broad Foundation and continue to insist that they are funding our work. We have never requested or received funding from the Broad Foundation. What about the allegations Project Renaissance recruited Amy Frogge’s opponent? Not true. We have also been accused of political activity, including a claim by Ms. Frogge on her public Facebook page that we recruited her opponent. As a 501(c)(3) nonprofit, Project Renaissance has not engaged in any political activity, including recruiting candidates or participating in political campaigns, and our organization is not endorsing or advancing the cause of any candidates in this or any election. Doesn’t Project Renaissance support vouchers and employ lobbyists? Not true. We are not supporting vouchers. We do not employ a lobbyist and do not engage in any lobbying at the state legislature. Sitting school board members are to blame for this false spread of information. It’s sad that our elected officials would rather spread lies than discuss education with Nashville’s parents. Public officials should be mindful of the irreparable harm that false accusations cause. While lively debate is a reality in the education arena, defamation takes things too far. Wendy Tucker again extends the invitation to the forum to Pinkston, Frogge, and Jill Speering. Are these school board members too afraid to talk to a group of diverse parents? It looks that way so far. Earlier today, I reported on the links between Nashville’s Project Renaissance/Nashville RISE and national groups promoting corporate education reform. Specifically, I noted Renaissance’s membership in Education Cities and the similarities between what’s happening in Nashville and what’s happening in other “Education Cities” like Indianapolis. It’s important to also examine what’s happening in Indianapolis — a district following the Education Cities playbook — in order to see if that’s what we’d like to have happen in Nashville. But of the 18 charter schools operating this year (2014-15) in the city that took ISTEP last year, about half fell below the Indianapolis Public Schools districtwide average of 51.6 percent passing. These results may not be surprising, but they certainly don’t point to an Education Cities success story. Here’s something else that’s interesting. Charter advocates have built clout in the Indiana legislature and used it create a charter school cash advance program — a payday loan of sorts, but with far better interest rates. The Indiana State Board of Education on Wednesday endorsed a plan to divvy out as much as $40 million in loans in the 2015-16 school year through a controversial new state program to fund charter schools. The per-student limit means a charter school could receive a maximum advance of $1,836 per student from their state tuition support, according to information shared by board staff. That could lead to some schools receiving less than what they requested. Two schools are seeking approximately $45,000 per student. Under the program, eligible charter schools can request a maximum of $5 million. Interest rates on the loans are set at 1 percent. That’s a pretty friendly interest rate provided to schools that may or may not get results. The point is, it’s not clear from Indy’s example that theirs is a model Nashville should follow — even though Nashville’s ed reform advocates are using the same playbook used in “Education Cities” around the country. Chris Reynolds, the CEO of LEAD Public Schools, is out with an editorial in the Tennessean. The editorial discusses how Cameron has been transformed from the lowest preforming school in the state with declining enrollment to a reward school for growth and a 20% growth in enrollment. Cameron was a Black high school in Nashville during segregation and graduated many of the Black leaders in Nashville. Thanks to the amazing partnership with MNPS, the Cameron facility just held it’s first graduation in 40 years! Every person in the graduating class was accepted to a four year college. That’s a great way to continue the legacy of Cameron. In just five years, Cameron has been transformed, and we have learned a great deal about what it takes to engineer such a successful turnaround. We have learned that our vision of success for all students works. Cameron serves a high number of students with special needs, extraordinarily high numbers of English language learners, and accepts all students at all times of the year, just like any other school does. No one is turned away, yet our expectations remain high. Cameron (like three other LEAD campuses) has now become a top 5 percent Reward School for growth. In addition, the transformation has brought nearly 20 percent more enrollment back to the neighborhood school, reducing the number of students who had once been opting out for other schools. Our families are thrilled that Cameron has been restored as the reliable educational asset it once was, and we are honored to be able to serve our community in this way. Our teachers and staff have done truly special work that is a lighthouse for what the future can hold for all students. We have learned that partnership is not always easy, but is the best path to sustained success. We have also learned a great deal about what students and families in the most vulnerable of circumstances face and how to support them. The involvement of Project Renaissance/Nashville RISE in this year’s MNPS school board races has been the source of a bit of controversy, from promoting (then deleting) an event with Stand for Children to a Phil Williams story raising questions about the source of funding and lack of disclosure. A group of incumbent board members have said they won’t attend the upcoming forum and Zack Barnes on this blog asks questions about that decision. This all may seem a bit much over a group that bills itself as a grassroots collection of parents dedicated to improving school quality. Of course, Nashville has seen what an organic grassroots schools movement looks like. Just look at East Nashville United as one example. There’s something a little different about Renaissance/RISE and it merits further examination. As the Phil Williams story points out, Nashville RISE is incredibly well-funded, backed by money from philanthropic interests and by supporters of the charter school movement. Also backed by some donors who don’t want their identities revealed. But there’s more. Project Renaissance/Nashville RISE is part of a national network of groups known as Education Cities. Our members are nonprofit organizations that create and coordinate ecosystems that foster the growth of high-quality public schools in their respective cities. Together, our members are improving opportunities for millions of children and their families. To find out more about our members, please click on the map or list below. A closer look at two cities with Education Cities member organizations that have impacted education policy reveals a need for caution. This may all sound quite familiar, in that the rhetoric of Renaissance/RISE and Nashville’s charter sector is consistently focused on quality “seats” rather than the children who occupy those seats. Next, let’s turn to Indianapolis, where their version of Renaissance/RISE is called The Mind Trust. You guessed it, The Mind Trust is also an Education Cities member. Also, Project Renaissance lists Ken Bubp as a Board Member and notes his role as Vice President of The Mind Trust. What you are about to read may sound eerily familiar, as current MNPS board member Amy Frogge recently raised concerns about the high cost of school board races in Nashville. In her campaign to oust Roof, who had been elected board president, from Roof’s at-large seat, Sullivan (the reform candidate) raised more than $70,000, inundating the city with mailers, phone-banking, and paid media. She trounced Roof by more than 25 percentage points. Miller suggests that what happened in Indianapolis is part of a broader, national effort supported by the likes of the Broad and Walton Foundations. And here’s something interesting about all that: The funders of Education Cities include The Broad Foundation, the Walton Foundation, and The Gates Foundation — the Big Three in corporate education reform. Perhaps more interesting is the group of partners, including the pro-voucher Fordham Institute. All of the above are big players in the drive to remake American public schools, though it is difficult for that group to point to a true “Education City” success story. What is clear is Renaissance/RISE is following a playbook developed by outside interests. Looking to Minneapolis or Indianapolis can help us see where that playbook may lead Nashville.